Spring Awakening, the USD theatre department’s newest production, showcases electrifying, realistic and raw performances, as it relieves the original 19th-century play. USD theatre’s remake displays the relevance of the 1891 German play as it explores the tumultuous journey from adolescence to adulthood. Matthew Nesmith, associate professor of theatre and play director said the new play explores the timelessness of the original story. Nesmith said the show, set in the original setting of 1890s Germany, dives into several topics relevant to the 21st-century world. Nesmith said producing a concert performance from a show was something new for the department. “We scaled down some of the staging elements to fit a smaller stage and space. The goal was to share what we do at USD, and to introduce our department and students to a new audience, also to explore different performance style and mediums, because doing a concert version of the show is something we hope to do more down the road,” Nesmith said. Jackson Whitaker, junior musical theatre major, plays the role of Melchior Gabor, the main character, a 17 year old handsome, “intelligent know-it-all” boy, who faces difficult life experiences. He said this show separates itself from past theatrical works as the performance is synonymous to a rock concert. “It’s in many ways a rock concert. Different elements of our production, like hand microphones while singing, creates a different relationship with the audiences,” Whitaker said. Whitaker said their interpretation of the play connects to issues represented through the story, “things of the heart,” still are relevant today. 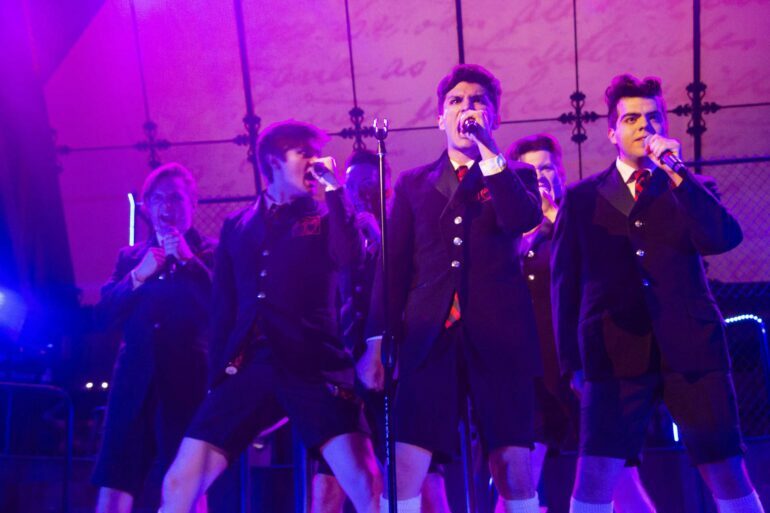 Spring Awakening will be performed at the Wayne S. Knutson Theatre from April 11 to 14.